RBTH presents a selection of views from leading Russian media on international events. Today, there is no discussion in Europe of terminating sanctions early against Russia, conflicting sides in eastern Ukraine are one step away from renewing full-scale combat and representatives of unrecognized republics in eastern Ukraine accuse Kiev of deceit. The centrist newspaper Nezavisimaya Gazeta reports that while several European countries have expressed wariness concerning economic sanctions against Russia, it is still too early to discuss their termination, especially as the position of the U.S., the UK and Germany has not changed. Washington and London have warned the EU that now is not the time to ease the sanctions and have expressed their intention to continue its policy of pressuring Russia as a result of its actions in Ukraine. Dmitri Suslov, deputy director of the Center for Comprehensive European and International Studies at the Higher School of Economics agrees that in the short-term, solutions to the lifting of sanctions will not proceed. "The U.S. will take all measures to preserve the sanctions regime," Suslov said. 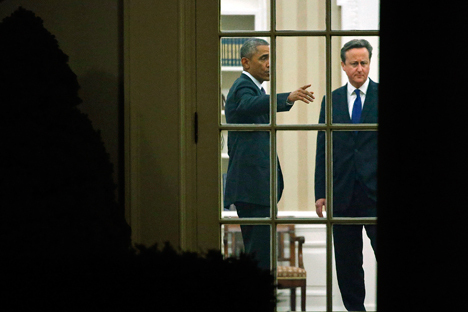 "If the EU decides to soften them, it will be a blow to American leadership." According to Suslov, the Europeans will not cancel the sanctions in March  because in order to do so there must be a consensus. "It is obvious that this won't happen because of the UK's position, which is closest to the U.S., but also because of the Eastern European and Baltic countries, as well as Germany," explains Suslov. "Germany's government has understood that in order to strengthen its leadership in the EU, it needs to assume an anti-Russian stance. And Germany is not preparing to relax its position." “Any worsening of the situation in the Donbass [region of Eastern Ukraine] is automatically considered by the West as being the machinations of Russia,” said Sergei Mikhailov, senior collaborator at the RISS Center of Euro-Atlantic and Defensive Studies. "Kiev may choose any scenario, including carrying out a strike on Donetsk, if, for example, that will be the lesser evil in comparison to an economic collapse, which, it seems, Ukraine is expecting." The Kommersant business daily writes that the conflicting sides in eastern Ukraine are one step away from renewing full-scale combat, having practically buried the agreements reached in the Belarusian capital of Minsk with Russia's and the Organization for Security and Cooperation in Europe’s (OSCE) mediation. Moscow confirms that Ukrainian President Petro Poroshenko rejected the peace proposal that Russian President Vladimir Putin offered him. On January 18 the Ukrainian army received an order to start a massive operation to take back the Donetsk airport, which Ukraine believes does not violate the truce. The area until recently was controlled by pro-autonomy forces. The shelling affected not only the airport but also certain residential blocks in Donetsk. In turn, Kiev accused pro-autonomy forces of firing on the positions of Ukrainian security forces. Ukrainian experts interviewed by Kommersant suggest that the intensification of the conflict is due to Kiev's domestic situation, the tone of which they say is dictated more and more by proponents favoring a radical approach. "The party of war is now gaining momentum in Ukraine and it thinks that military activity is the only way out of the situation," says political analyst Andrei Yermolaev. "Kiev's recognition of the Lugansk People’s Republic (LPR) and the Donetsk People’s Republic (DPR) as terrorist organizations shows that the Ukrainian government is not willing to compromise. The battle for Donetsk Airport, the tragedy in Volnovakhoi and last Sunday's Peace March in Kiev are ways of constructing the image of the enemy." The pro-government news outlet Vzglyad writes that the Ukrainian government sent a petition to Russia stating that it is willing to stop military activity in the Donbass region. By doing so Kiev is trying to ignore the unrecognized LPR and DPR republics, according to its representatives. "By addressing Russia the government in Kiev is again being deceitful," said Denis Pushilin, a DPR representative during negotiations. "They are suggesting that Moscow sign something, but Russia is not involved in the conflict. This way Ukraine is trying not to take us into consideration, not to talk with us, which is not correct. The ceasefire proposal is normal, but they are addressing the wrong side. Once again they are trying to ignore our presence, though the action itself is being waged directly against us." Director of the Kiev Center for Political Study and Conflict Mikhail Pogrebensky believes that the Kiev government has decided to stop fighting because they do not have the capacity to continue the attack. The renewal of combat in Pogrebensky's view is a dead-end. "There is no military solution to the situation,” he says. “This is obvious, and any delay of a truce will lead to additional losses - in technology and in the lives of people on both sides."